Tiger & Bunny 14 - Is It Love? The second half of the season kicks off with a new OP and ED; personally, I quite like the new OP, but I prefer the old ED. 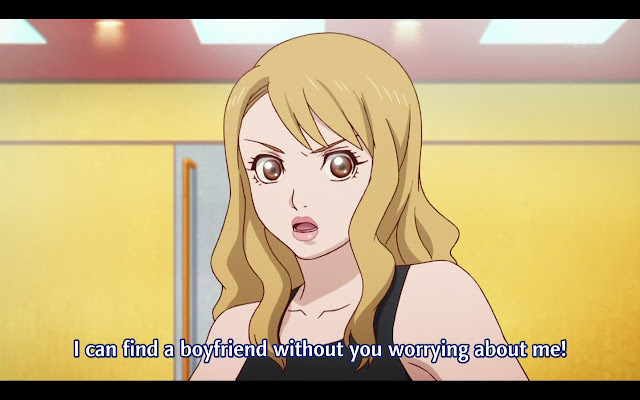 As for the episode itself, there's not a whole lot of plot going on; it's just Karina herself confirming the crush she has on Kotetsu, which was made obvious to the viewers many episodes ago. 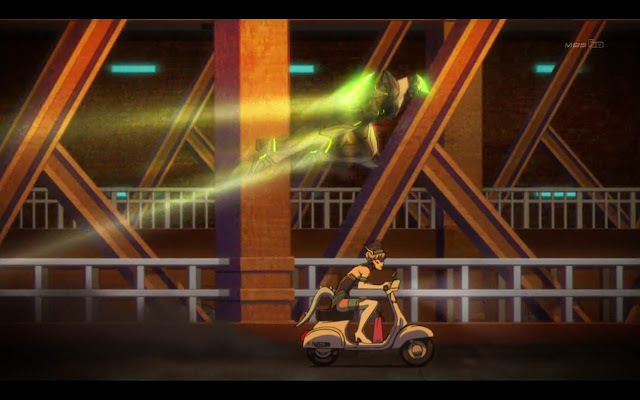 Ten months have passed since the incident with Jake Martinez, and our heroes Kotetsu and Barnaby have worked seamlessly with each other, climbing up the ranks of Hero TV. They even managed to keep Lunatic in check. I'm glad to see that Kotetsu is getting the recognition he deserves. I would have liked to see actual fight scenes with Lunatic, but I guess it can't be helped. 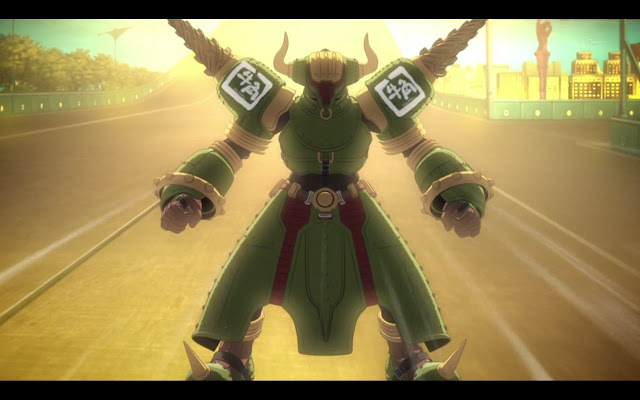 Judging by the animations in the opening sequence, I'm sure we'll get to see Tiger and Barnaby clashing with Lunatic again. 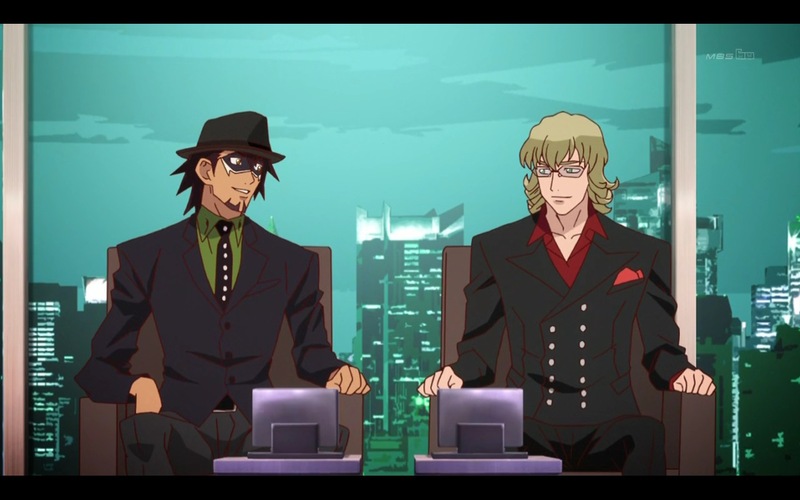 It also felt weird to me that Barnaby was all deredere for Kotetsu. I was surprised that he didn't revert to his usual self because that's what makes their character interaction fun. The highlight of the episode was probably his robot dance moves. REET REET. 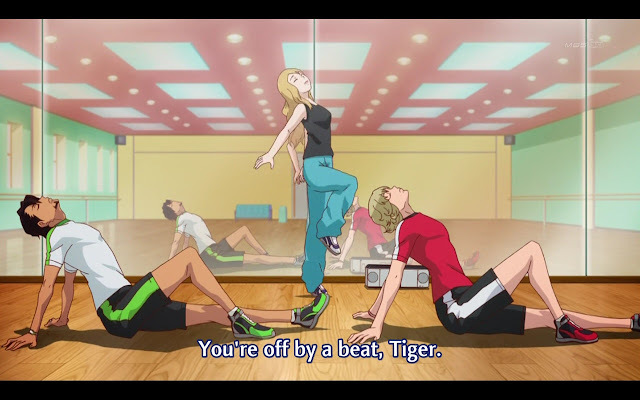 Karina is doing a collaboration with the duo from Apollon media, and she teaches them the dance choreography. Before she realizes her feelings for Kotetsu, she was displaying typical tsun behavior, which came off as a bit whiny. 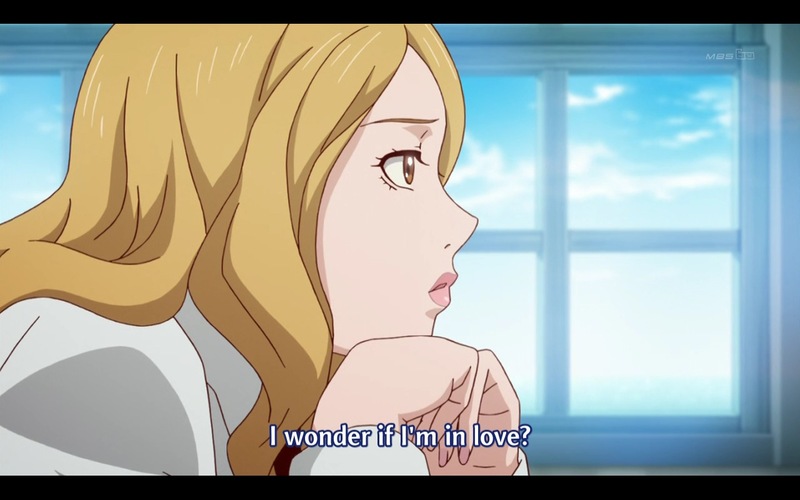 However, Kotetsu is no Nathan, so he doesn't realize her feelings for him. Judging by their interaction, I think we can safely say that Karina will be forever daughter-zoned, which is a direction I like. Kotetsu will never see her that way, and he is always playing the parent for the younger heroes. Our criminal of the week is this backstage thief dressed up as Blue Rose. I will never understand why some people develop this sort of unhealthy obsession for their favorite idols or whoever. Anyway, I'm probably the only guy watching the show that didn't recognize him as the guy that was subbing for Barnaby way back in episode 7. 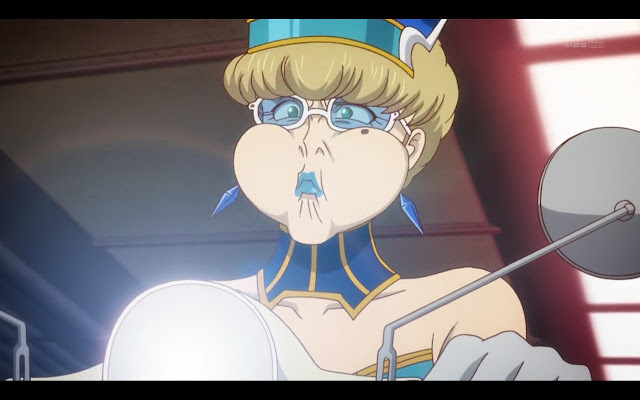 He's a NEXT that can turn invisible for holding his breath, which reminded me of remunerations from Darker then Black. The main thing to take out of this episode was this: Kotetsu's powers seems to have gotten stronger, yet lasting for a shorter amount of time. Kotetsu speculates that this might be his powers evolving, but I highly doubt that. The slightly ominous music playing when he speculates seems to suggest that it isn't some simple midseason power boost, and that something bad is going to happen. Though I'm too sure what to think, I'm leaning towards Kotetsu's power burning out. We don't really know what happens to NEXT powers over time. Did Stealth Soldier retire from being hero because his powers ran out? Or did he retire because passing on his hero duties to the next generation? A shout out to Antonio because he is much needed because he's such a cool guy. After the small timeskip, Antonio is finishing at last place for Hero TV. It was a little sad to see that his company was going to consider firing him if he didn't make something happen. I loved it when he said he's here because he wanted to see Kotetsu dance; it sounded like something Nathan would say. He'd make a good drinking buddy. As I've said before, I prefer plot episodes over character episodes, but this one gave me a few laughs, so I still enjoyed it. 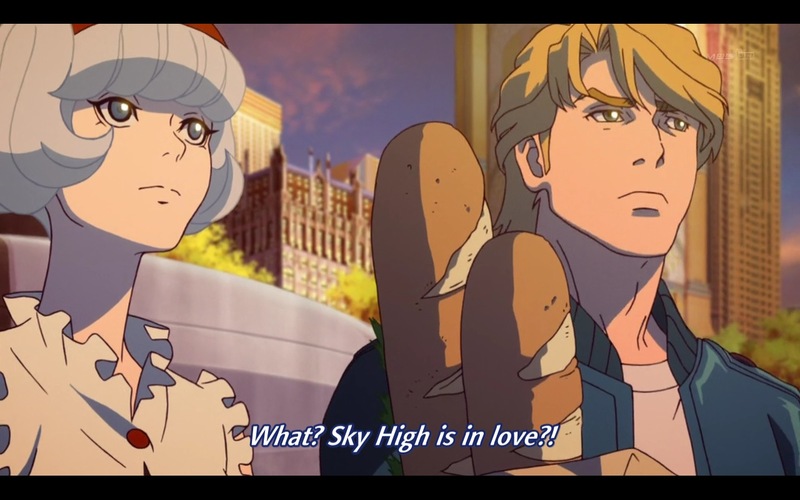 We are finally getting our long-awaited Sky High-centric episode next week! I wonder what Sunrise is going to do with our lovable moeblob; I'm really looking forward to it.